From an urbanistic point of view, Tirana is first and foremost a physical space, relatively easy to forget. It is a bit harder to define the city's public space, gone through radical transformations in the last few years. Under the totalitarian regime, the capital's public space had created a physionomy of its own: squares, streets, parks, stations, libraries...all spaces where people could move freely, where they had an identity - needless to say, within the boundaries of the architectural and urbanistic philosophy of the time. Everyone can easily understand - people from Tirana better than any other - how the city's public space has shrinked in the last few years. The main reason involves its "occupation" by private property. The most emblematic case is to be found in the park "Rinia" ("Youth") in downtown Tirana, that during the nineties turned into a battlefield of two dimensions. Before the citizens' very - and dazed - eyes, the park was savagely mauled by packs of private interests, that stuffed it with bars, pubs, and restaurants of all sorts trading in beer, raki, and idleness. The requalification of the "Rinia" park in the last few years is undoubtedly a great conquest, and yet a lonely one. It would be worth celebrating generation after generation, had it not had a sort of numbing effect towards legitimate reactions of public space as a whole. The park is offered up, usually in political discourse, as a trophy of the city's "victory" against brutal privatisation - fatally confusing the battle with the struggle. On the other hand, it must be considered that public space is also defined by its use. For example, a park or a square that are constantly closed cannot be defined public. In this regard, public space has gone through constant mutilations during the years of democracy. This happened for reasons that are objective (increased number of cars), urbanistic (pavements disappearing or decreasing), but also subjective (increase in the use of cars). 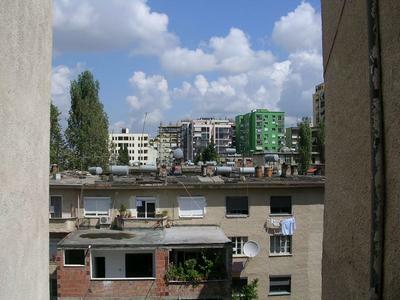 Blloku, the famous neighbourhood of the Communist leadership, has an opposite history. From strictly private - it used to be watched by the Republican Guard - it became a public and busy space. Yet, it must face chaos, traffic, constructions, works in progress, and so forth. It is worth noting that Blloku lacks a public park of its own, as it was initially designed with "private" parks around the manors, guarded by soldiers with kalashnikovs in their hands. Blloku itself was a sort of private park, where members of the Albanian Politburo strolled undisturbed along tree-lined avenues. In other words, we now end up with a stunted public space, more adapted than designed according to its purpose. If public space used to have essentially ideological elements, where even abnormal void had its own totalitarian function, currently there is no such thing. We cannot say, though, that ideology was left out in the cold. It lacks homogeneity, unity - perhaps similarly to a nebular matter that has not materialised yet - but the past's ideological elements still cohabitate with more recent ones. The very idea of parade survives: yesterday, standing before the Red Tribune - today, in a car before shimmering shop-windows. The problem is, conceptually speaking, cars and public space are at the antipodes. Individualism is wrapped up in the bodyworks' shell, be it shining or scratched, functioning as a wall in human relationships. Furthermore, sooner or later, those who design cars like shoes will see in trees and public spaces mere encumbrances to their lonely path. Urban planning in post-totalitarian years had to face the pressure of a cutthroat capitalism without rules, that found in construction the ram to crash the doors of public space. The housing demand is too strong to give architecture the time necessary to elaborate some kind of identity, oscillating like a pendulum clock between kitsch and eclectism. The periphery has been - and is being - ravished to the last inch by both abusive and legal constructions. Public space is an alien notion around here, when not invaded by mud, bricks, and concrete. The inhabitants of the periphery were made aware of such a concept only when it was thrown on the first pages of newspapers, as happened with the "Zogu i Zi"roundabout , when urbanistic choices turned into a battlefield between Albanian political forces. This is another function of public space here: to turn into a ring where political forces train and fight. The "Liqeni Artificial" ("Artificial Lake") park is another place of exceptional symbolic value. Inch after inch, bite after bite, the private sector is gradually devouring it. Even the part that miraculously survived owes its life to the service it offers to private business from an aesthetic point of view. Thus, we have public space living in function of the private, instead of private business serving public space. The railway station has never meant for Tirana's people what Termini means in Rome, or Atocha in Madrid. However, especially in summer, it did have some significance for those who went to the seaside, or came from other towns to see their families or simply solve some problems. Now even the shell of that station is gone, as Albanian railways were sentenced to death by recent policies privileging road transport. A bizarre fate awaits a city that for so many years had been designed and developed under the notion of public space, temporarily conditioned by ideology, but faraway from traffic and the private overwhelming the collective dimension. Nonetheless, as an inhabitant of Tirana, I keep dreaming people-oriented public spaces for my city, as well as long strolls along streets and pavements. Downtown, but also in the periphery. I see myself walking without fatigue, perhaps surrounded by trees, and eventually saying: "Shall we walk some more?". Perhaps just to myself.